4.2 out of 5 based on 45 bloggers and 11 commenters. 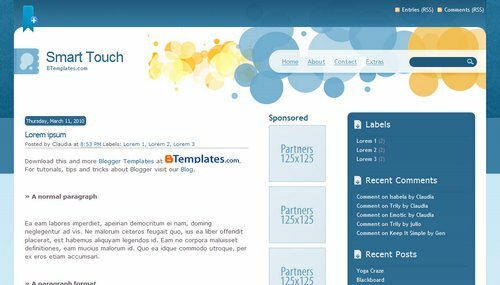 Smart Touch is a free blogger template adapted from WordPress with 3 columns, right sidebar, rounded corners, ads ready and geometric motifs. Thanks a lot for the templates. I don’t need the adds so I deleted them, but I would like to know how can I reclaim their space (meaning, making the template “2 columns” instead of “3 columns”. Which dimensions should I change? Thanks Claudia, the blog looks much better! Since I now have more space available (after I deleted the adds), I would like that everything fits in the screen (without needing to scroll horizontally). I tried to change the value of the container but didn’t succeed. Could you please instruct me how to change the dimensions of the other sections so that the blog fits in the screen? @Gad: I can’t help you with this, because we should need to create this template again. The template was created for 1200+ pixels width screens. How to cange size and font in post?